President Barack Obama’s attempt to abruptly push aside Egyptian President Hosni Mubarak in favor of a transition government has sparked a rift with key Arab allies Saudi Arabia and United Arab Emirates, which fear the U.S. is opening the door for Islamist groups to gain influence and destabilize the region. Vying to influence the outcome of events, Saudi Arabia and the U.A.E. have sent public and private messages of solidarity to Mr. Mubarak and his vice president, longtime intelligence chief Omar Suleiman, diplomats said. The messages amount to support for the president and Mr. Suleiman to oversee the transition and to ensure that Islamists can’t fill any possible power vacuum. The support from Arab states has provided a measure of comfort to Mr. Mubarak, who announced he wouldn’t take part in September’s election. It may in part explain why the Egyptian president rebuffed Mr. Obama’s call for an immediate transition that includes the opposition. The backlash shows how the turmoil in Egypt is rapidly reshaping U.S. policy in the region. In deciding to set itself against Mr. Mubarak, a U.S. ally for decades, the United States is now facing the disquiet of other friendly Arab governments, who have long provided support for American policy goals. Meanwhile, Islamists in the region, including Hamas and Hezbollah, believe they are on the ascent as U.S. allies falter. Such a scenario was one that defenders of the Middle East’s status quo warned was possible, and shows how Mr. Obama’s options were all, in some sense, unpalatable. The president was criticized early in the unrest for not clearly favoring antigovernment protesters. Now, having done so, he might have alienated key regional U.S. partners in the fight against al Qaeda and Iran. People familiar with the situation said Israel, the United States’ closest ally, has privately echoed Arab concerns about a U.S. push to kick out Mr. Mubarak, and worries Washington underestimates domestic Egyptian support for the Muslim Brotherhood and other Islamist parties. 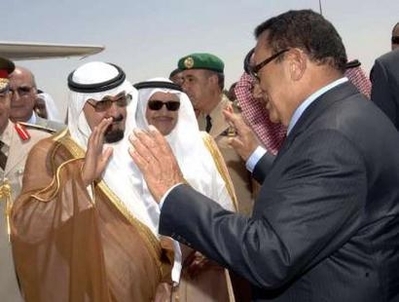 It is unclear how much sway the Saudis have with Mr. Mubarak’s regime in Cairo, given that the extent of its financial aid to Egypt isn’t known. The United States gives Cairo about $2 billion a year. Egypt and Saudi Arabia are major trading partners, and experts say Saudi and Egyptian intelligence services have especially close ties. “You don’t need to read between the lines too much to see [the Saudis] are in favor of stability,” said Richard Fontaine, an analyst with the Center for New American Security and a former adviser to Republican Sen. John McCain of Arizona. Senior officials from the U.A.E., another key regional ally, have said in recent days that the unraveling of Mr. Mubarak’s government threatens to provide breathing room for Islamic extremists and Tehran. Egyptian security forces have been among the most aggressive in seeking to combat Hamas and Hezbollah, Palestinian and Lebanese militant groups that receive their arms from Iran and Syria. Another Arab official from a government aligned with Washington said the Obama administration seems to be humiliating Mr. Mubarak, despite his close cooperation over the years. This could lessen the willingness of Arab states to cooperate with Washington in the future, said the official. Mr. Obama took a calculated risk by aligning himself this week with the opposition, which includes the powerful Muslim Brotherhood, a group banned by Cairo and long shunned by Washington because of concerns about its ties to Islamist extremism. U.S. officials acknowledge that Mr. Obama’s decision to turn on Mr. Mubarak has raised ire in Arab states, which fear the United States could turn up the pressure on them next. Another U.S. official said the Obama administration understood Arab concerns that Islamists might try to take advantage of the Egyptian elections to win power, but said Arab states nonetheless needed to revamp their sclerotic political systems. Officials are reassessing the extent it could engage with Muslim Brotherhood. Anthony Cordesman, an influential defense analyst at the Center for Strategic and International Studies, played down the impact of outside influences on Mr. Mubarak, whether Saudi or U.S. Mr. Obama, he added, was “one voice among many” and argued that domestic considerations were the biggest factor for the regime in figuring out what to do next. White House officials spent Thursday working on new language the U.S. president might use to make his demands on Mr. Mubarak more forceful, according to outside advisers. Much of the administration’s attention was on the treatment of journalists in Cairo. U.S. officials suspect regime element might have been behind the attacks. Secretary of State Hillary Clinton urged Mr. Mubarak to “immediately” begin talks with opposition leaders on handing over power to a transitional government. “I urge the government and a broad and credible representation of Egypt’s opposition, civil society and political factions to begin immediately serious negotiations on a peaceful and orderly transition,” Mrs. Clinton said. Middle East experts say the goal of creating a new transitional government is not yet in reach. The Egyptian military would have to become more assertive to “control the arena,” said Martin Indyk, a former U.S. ambassador to Israel. “This will require the military to undergo an overnight conversion to democracy promoters. That’s more than a stretch in the current circumstances,” Mr. Indyk said. —Jonathan Weisman contributed to this article.